I have to say this has always been my long time favorite!! This is my favorite cover. 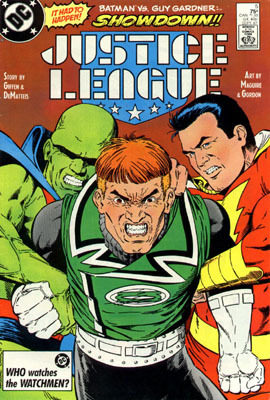 Being a huge Guy Gardner fan I was sure he was going to lay the smackdown on Bats when I cracked that comic open. Needless to say, the fight didn't live up to my expectations. Still it's my favorite cover. Last edited by Tommy; 02-13-2006, 11:10 PM. Reason: Don'tcha hate it when you make typos?